PBA is joining forces with the National Arboretum to celebrate World Bonsai Day with three days of vendors, demonstrations, workshops, activities for beginners, and study groups for existing PBA members. The World Bonsai Day Festival will be held at the U.S. National Arboretum in Washington D.C. at the National Bonsai & Penjing Museum. RBS Members are encouraged to prepare their own trees for the PBA member exhibition, volunteer, or attend the workshops and study groups. See Thomas if you have any questions. More detail and the daily schedule on the PBA web site. Just a few tips and reminders. Make a weekend of it. There are plenty on inexpensive hotels in the area and lots of other things to do in D.C. too. Bring cash, snacks and water, and hats or scarves, sunglasses, and sunblock. There is little parking up close to the site, but there is plenty of satellite parking with shuttle buses. You may not want to go back and forth to the car, so pack a tote bag or get there early. Please register for the study groups ASAP since they are limited. Also, start now preparing your trees for the member tree show. I will personally transport them if you cannot. Lastly, please register as a volunteer for a few hours while there. It started off as such a nice spring, but just when you think all is going well, Mother Nature throws a wrench in the works. As I as write, I know many of you are worried about this cold snap, not to mention the constant wind. The warm temperatures brought out flushes of tender leaves and now there are lots of droopy trees. Luckily, it seems that my trees did not suffer too much and will recover with minimal damage, but I know others are not as lucky. What’s important is to remember (record, photograph) which trees had the most damage so that you can be sure to protect them in the future. If your trees were damaged, my best advice is to let Mother Nature do her thing. The trees may be ugly for a while, but they will recover. I am excited for the amazing lineup of activities schedule this spring and especially for the World Bonsai Day Festival in May. I hope that everyone takes advantage of all of these activities (you pay for them). Please let everyone know if you are interested in driving or sharing hotel rooms for the festival. Working with Roy Nagatoshi is always fun and RBS hasn’t seen Bob Mahler in 10 years or done a formal shohin workshop in as long as I can remember. Plus, we are working on some new ideas for the Annual Picnic and Auction. Don’t forget, that is when we elect 2016-18 officers (4 officers and 1 at-large board member). The slate of candidates will be hopefully be available at our April Meeting. As you may have noticed, we have been making changing to our web page and email services. I apologize for the duplicate emails and funny formats in the newsletters. Interestingly, the formatting does not seem to translate the same over different platforms and it seems the new formats look much better on phones and tablets than in traditional on computers. I am learning as we go along. We are making progress, even if it’s at a crawl. To that end, if anyone has experience with html or Word Press, please let me know if you can help! RBS members worked together and helped each other on their own trees sharing techniques and ideas. Randi applied wire to several trees for bending later. Thomas and Jan prepared trees for a group planting, and Barbara pruned and wired a few trees. Working together is always fun and informative. Once again, RBS is delighted to have Roy’s expert skills once again for a double session workshop. Roy is particularly known for working with conifers, but the workshop is not limited to that. The two sessions will run from 1-4 pm and 5-8 pm. Each session will cost $50 and will be limited to 7 participants at a time. You can register for one or both session. Contact Thomas to register. This workshop would be good for less experienced to advanced practitioners, but probably not for absolute beginners. This workshop will occur will happen at our normal meeting place, the Community Room at St. Mary’s Woods, 1257 Marywood Ln, Richmond. Double Workshops with Bob Mahler of Kifu Bonsai on April 25, 2016. Pre-registration is required for both workshops, but everyone is welcome to just come watch for free. All of these activities will happen at our normal meeting place, the Community Room at St. Mary’s Woods, 1257 Marywood Ln, Richmond. BYOT (Bring or Buy from Bob) 1-5 pm. $50. Limited group size. Bob, who specializes in a variety of deciduous tree and satsuki azaleas will work with you on your own material, but will also bring some workshop stock. The workshop fee is $50 and does not include materials. You must already be a RBS or PBA member to participate for this event, but all members are encouraged to come watch free of charge. Bonsai 101 Class: 6 pm. This 45 minute lecture is designed for absolute beginners and will answer very basic questions about workshop. It is recommended for anyone who has no experience with bonsai but would like to participate in the 7 pm Shohin Workshop. April Meeting and Shohin workshop. 7 pm. Shohin, literally “small stock”, is the second smallest traditional category of bonsai ranging from 6-12 inches high, including the pot. Bob Mahler will provide a choice from a variety of small trees and all materials including soil and pot. The cost of this workshop is $25 and is ideal for beginners. Anyone who has no prior experience with bonsai is highly encouraged to attend the Bonsai 101 Class immediately preceding this meeting and workshop. Photo of typical stock for this workshop to the left. RBS Double Nursery Crawl, May 7, 9 am, at The Gardener Nursery, 12685 Broad Street Road, then 10:30 am at Strange’s Garden Center, 12111 West Broad, Richmond, VA 23233. We invite all interested to come and discover the possibilities of nursery stock as bonsai. This is particularly a good learning experience for newer members since you will get to do it along side of more experienced members. Plus, Strange’s has pre-bonsai stock and bonsai pots. It’s called a “crawl” because we often fins ourselves crawling around looking at trunks and roots. After the crawl, join us for the Member Study Group/Workday.May Member Study Group/Workday. RBS members are invited to bring their own trees to work on together Saturday, May 7, from 10:00 am to 4:00 pm in our normal location at St. Mary’s Woods. The point of a study group is that you can solicit advice and guidance from other members, or just come watch and learn. The long day gives you plenty of time to start and complete projects. Members should bring tools, drop cloths, refuse containers, and cleaning supplies as needed for themselves. 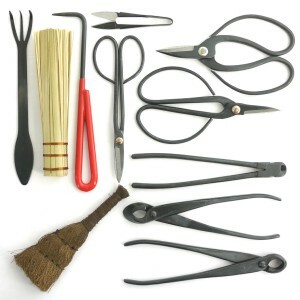 A beginner looks at the large selection of bonsai tools available and wonders which ones are truly needed for his use. Tools fall into 3 main categories according to their end function: pruning/cutting, wiring, and potting. All tools must be kept sharp, clean, and free of rust and nicked edges. Necessary pruning/cutting implements are scissors, concave branch cutters, spherical knob cutters, and folding saws. Scissors usually have a small shearing area, but are structured for mechanical advantage (i.e. ease of cutting). Bonsai scissors also are have a sharp knife-edge (vs. the standard offset shearing edge), in order to obtain a clean, precise cut. Bonsai aficionados usually have several pairs of scissors of different sizes – some for precise, small-scale trimming of needles and leaves, and others for small branches and heavier cutting duties. In contrast, concave cutters are used to remove larger branches so that they will heal flush to the trunk surface. Sometimes cutters of different sizes are needed, since the general rule is that the branch diameter should be half the width or less of the tool cutting surface. Knob cutters are used to scoop out a stubbed branch below the surface plane of the main tree trunk – a circular cut; re-growth in the wound area will then produce a flush trunk surface. Saws, of course, are for cleanly removing large branches. Wiring tools primarily consist of pliers and wire cutters. The contact area (jaws) of these pliers is smooth and has a small gap. This allows the pliers to be used for bending wiring and as a jinning tool. The tool handles are long and the jaw area is small, thus allowing for applying pressure precisely and with mechanical advantage. Wire cutters are used to cut small diameter wire and to remove wire from branches without damaging the plant surface. Lastly, basic potting tools consist of a root hook for root cleaning, a scissors to prune roots, chopsticks to work the soil into the root cavities, and trowel to compress the soil surface. The jinning pliers do double duty to twist the wires that anchor the tree to the pot. Other implements such as turntables, grafting knives, soil scoops, and soil sieves are very useful, but the above tools are basic to our art.